Yesterday my daughters' school hosted a Halloween parade. 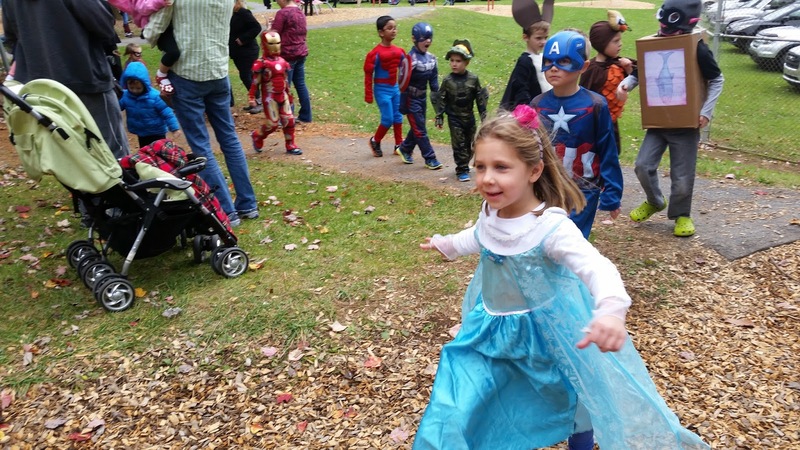 In single file, the costumed students marched three loops around the playground before their teachers filed them back into their classrooms for an afternoon party and sent them home for the weekend, high on sugar and life. I was impressed, but it wasn't with the costumes. It was the fact that so many parents had come. Some of us had taken time off from work. Others had rearranged their daily schedule and nap times with younger toddlers and babies. In the middle of a Friday afternoon when other responsibilities called for our attention, parents showed up. In droves, we showed up. I'm still not certain why this struck such a nerve yesterday, but it did. It still does today. These parents, my husband and I among them, are far from perfect. In the past week alone, it probably would be hard to count how many times we've collectively been impatient with our kids, or too permissive, or too strict, or too distracted, or what have you. But yesterday afternoon, despite it all, we showed up. We smiled and waved each time our children circled around the playground, taking pictures and offering high fives and giving compliments. No matter what, we show up. It's what parents do.